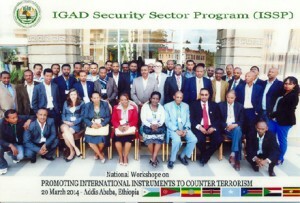 The African Centre for the Study and Re-search on Terrorism, represented by Mr. Elias BENYU (Training Specialist), participated in the Intergovernmental Authority on Development-Security Sector programme (ISSP)’s Ethiopia National Workshop on ‘Promoting International Instruments to Counter Terrorism’ held in Addis Ababa, Ethiopia on 20 March 2014. The workshop was organised in the framework of IGAD-SSP national capacity building which aims to capacitate IGAD Member States in the proactive fighting of terrorism in the region. The main objective of the one day national workshop was to promote legal instruments to counter terrorism and enhancement of a rule of law based approach to counter terrorism in Ethiopia. The workshop focused on encouraging the Ethiopia government to ratify (where it had not) and to domesticate international, regional and national legal instruments to counter terrorism. In particular the workshop sought to explore whether domestic counter terrorism law(s) in the Federal Republic of Ethiopia comprehensively criminalize offences outlined in various international and regional conventions against terrorism, and multiple UN Security Council resolutions. 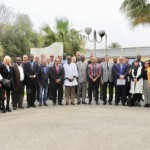 The workshop sought to familiarize participants with the substance and level of application of national counter terrorism laws, and with the promotion rule of law approach in countering terrorism in Ethiopia, as the country continues to enact several laws and ratify various international conventions against terrorism. The platform further explored the utility of international instruments and their place in domestic law and practice. 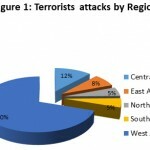 In relation to domestic counter terrorism provisions, the workshop sought to determine how comprehensive and extensive the laws were; and more particularly whether they provide, inter alia, for protection of witnesses and other judicial officers, enhance the counter terrorism investigative tools, criminalize preparatory and financial offences relating to terrorism and whether they support internal coordination and international cooperation. The national workshop brought together close to 30 senior counter terrorism practitioners, experts and policy makers from all branches of government; including the Ministry of Justice, the Office of the Attorney General, the Office of the Prosecutor general, National Intelligence Services, the Police, Parliament, National Counter Terrorism Coordinating agencies and Professionals in the Academia who play a role in counter terrorism law and policy making and implementation in Ethiopia. Speakers were drawn from various organizations including UNODC, African Centre for Study and Research in Terrorism (ACSRT), SAHAN Research (an independent Security Policy and Practice think tank in East Africa), ISSP and the Ethiopian government. – Domestic counter terrorism laws in Ethiopia. All the speakers focused on the role of each body in strengthening the capacity of AU Member States to fight terrorism guided by international, regional and national laws. 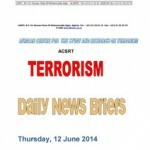 The African Comprehensive model law on the prevention and combating of terrorism. Some other additional resolutions, declarations and events were cited in the course of the presentation. These include the Nairobi and Dar es Salaam bombings of 1998, the UNSC Resolution 1373/2001, the 9/11 bombings as well as the Dakar Declaration of 2001. He also rallied the representatives of Member States to present our call to their respective governments to sign and ratify the Protocol to the 1999 Convention on the Prevention and Combating of terrorism in Africa so that it can become operational. The experts acknowledged the efforts by Ethiopia in the fight against national, regional and international terrorism and requested the national authorities to revisit their laws to align them with any instruments at regional, continental and international levels. 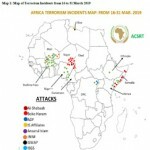 In the area of international cooperation it was stressed that Ethiopia harmonises its national counter terrorism laws with existing CT international instruments to boost the possibility of success of extra territorial investigations and extraditions and effectively contribute to the implementation of a regional strategy. The ACSRT delegate took the opportunity to brief the delegates of the existence of a fusion centre in the Sahel region, whose model the Ethiopian and IGAD authorities need to replicate to strengthen information sharing at national and regional levels. The national authorities were also called on to make use of the Model law by incorporating relevant provision thereof into the national criminal legislation.